Snow was falling furiously all around us as we wound up the mountain road. Several cars had turned off to the side of the road, and a bus had gotten stuck in a snowdrift. But we kept plugging along, hoping to make it to Davos before the roads became slick with ice. My sister Sarah and I had traveled to Germany to visit our sister and brother-in-law (Rachel and Mark), and we had all decided to travel to Switzerland for a wintry adventure. 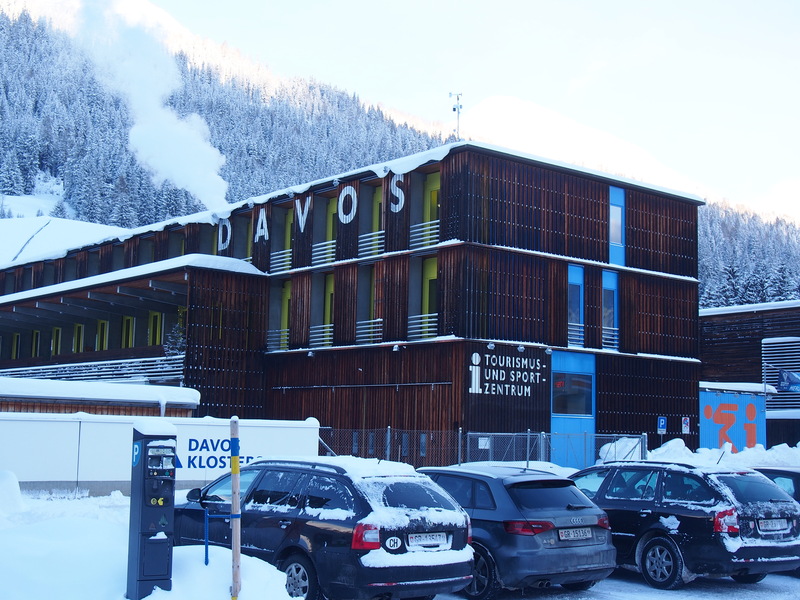 Driving to Davos was no easy task with the blinding snow, but finally we arrived at our hotel, Zentrum Haus. The rooms were simple yet sufficient. Each one had two single beds, a sink, and a closet. Each floor shared a shower room and bathroom. And best of all, they had free snacks in the common room that was on the first floor. There were oranges and apples, chocolate bread, and mini chocolate bars for an indulgent treat. For those on a tight budget, you could even cook your own meals in the kitchen. We were all tired that night, and after resting in the common room for a short while, we headed to bed. Tomorrow would be the first day of cross-country skiing. The next day we woke up to a pristine, crisp day with clouds hovering over snow-covered mountain peaks that were over 3,000m high. I felt like we had been dropped into a winter postcard. Last night’s snowfall had covered everything in pure, white beauty. After breakfast, we went to a sports shop in town to rent cross-country skis and boots. They were nothing like downhill skis. They were longer and thinner, and the boots were more supple and softer than downhill ski boots. In the front of the boot was a squarish piece that locked into the front of the ski, leaving the back of the boot free. We chose to do a 2km classic trail first. For classic skiing, you ski on two grooved paths that guide you along the trail. More experienced skiers do skating where they freely ski along the trail in a motion similar to ice skating. The first trail was challenging. Apparently, you’re supposed to glide along the path as you push one ski ahead and then the other. I felt like my motions were jerky and stilted, and my progress seemed painfully slow as experienced skiers sped past me. For the next trail, we attempted a steeper trail that began to wind up the mountain. Several cross-country ski teams swept by us. The snow covered-pine trees and unblemished fields of snow were stunning, but we were tired and ready for lunch. Eating a sandwich outside on a wooden table in subarctic weather is not the most pleasurable experience. But we were thankful to have a break and re-energize ourselves before our afternoon skiing. That afternoon we chose another trail that wound its way along a river with a pine tree forest on one bank and snow-covered mountains on the other. I was awakened from my reverie after running into an elderly man skiing along the tracks in the opposite direction. Apparently these tracks weren’t always one-way streets. Toward the end of the day, we skied along a trail that wound up the mountain, through a pine forest, and out into a meadow with a few cabins. Skiing up wasn’t so bad, but skiing back down the trail was a challenge. We all successfully avoided hugging any trees on the way down. After more than four hours of skiing, we headed back to our hotel, showered, and ate at a pizzeria for dinner. Later than night, we played some games of Monopoly Deal, a card game similar to Monopoly. I sipped my peppermint tea and nibbled on a slice of chocolate bread. The Snickers bar disappeared quite quickly. It was a fitting end to the day.